On the day President Trump signed a massive spending bill in Washington, D.C., Paul Charles and George Carl of Newtok sat down in a hotel conference room in midtown Anchorage to take stock of an event they still couldn’t quite believe was real. The budget bill included $1.3 trillion in spending and was more than 2,200 pages long. But for Newtok, there’s just one page that matters. That’s page 458. It doubles funding for the federal Denali Commission, giving the agency an extra $15 million. The commission said last week it plans to spend that money to help Newtok relocate, accomplishing a goal that’s been out of reach for more than two decades. 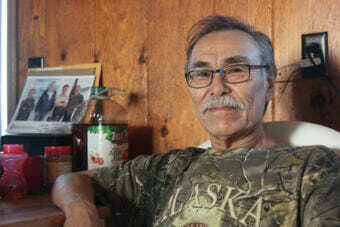 Carl, Newtok’s village council vice president, said the decision is life-changing. 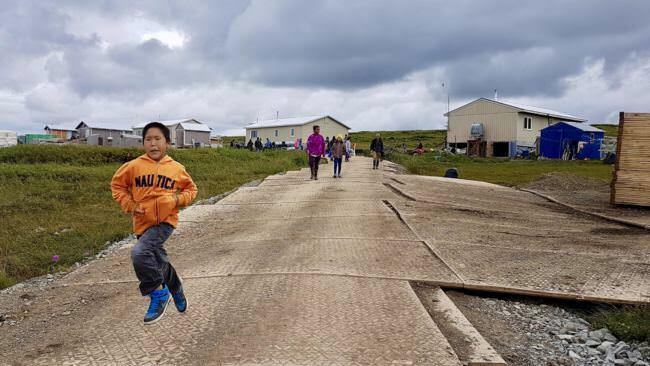 Newtok is rapidly losing land to a combination of erosion and thawing permafrost and residents expect they’ll have to abandon their homes within a matter of years. The village first decided to move in 1994. It acquired a new site several miles away in a land trade with the U.S. Fish and Wildlife Service in 2003. Ever since, the village has been trying to piece together enough funding to move. The $15 million in this year’s spending bill is just a fraction of what Newtok needs. The cost of moving the entire village is estimated at well over $100 million. But village council president Paul Charles said this is the crucial seed money that will make everything else possible. “It’s not that the whole village is going to relocate all at one time, but $15 million is a lot of money to build [homes],” Charles said. The relocation plan is unconventional: The village plans to retrofit old military barracks from Joint Base Elmendorf-Richardson in Anchorage and barge them out to the new site. Engineers estimate that will be cheaper than building new houses from scratch, helping to avoid some of rural Alaska’s high construction costs. If all goes well, the new funding plus existing grants could go toward the construction of 28 houses at the new site, said village relocation coordinator Romy Cadiente. His goal is to have people living there full-time by the fall of 2019. At that point, Cadiente said the new site, Mertarvik, would be a permanent community. He hopes it would have enough residents to be eligible for traditional infrastructure funding, including money for a school, an airport and water and sewer systems. Charles, Carl and Cadiente said the funding was the result of work by many people, from the Alaska congressional delegation and the Denali Commission to the village council’s relentless attorney, Mike Walleri, and countless federal and state officials. But Cadiente pointed out that the $15 million is a one-time funding stream. Several other Alaska villages are considering relocation, and even more need help dealing with erosion if they’re going to stay in place. They can’t all rely on a special act of Congress. Cadiente said ultimately, the country needs to find a different way to fund climate-related issues like coastal erosion. Julia Jimmey at KYUK in Bethel contributed translations from Yup’ik to English for this report.